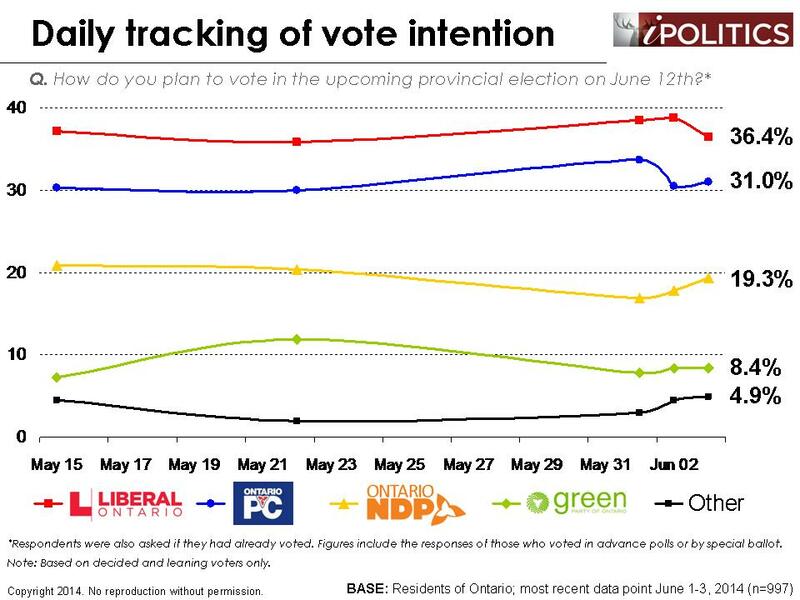 [Ottawa – June 11, 2014] – In a very important last-minute development, we see the race re-establishing its stable pattern from the pre-debate period. The Liberals now have a highly statistically significant lead of six points (36.6 per cent to 30.2 per cent) which places them not only in range of victory, but in majority territory. The evidence seems to show that the debate effect has followed a common pattern of dissipating and the electorate have reverted to the positions they held in the first three weeks of the campaign. 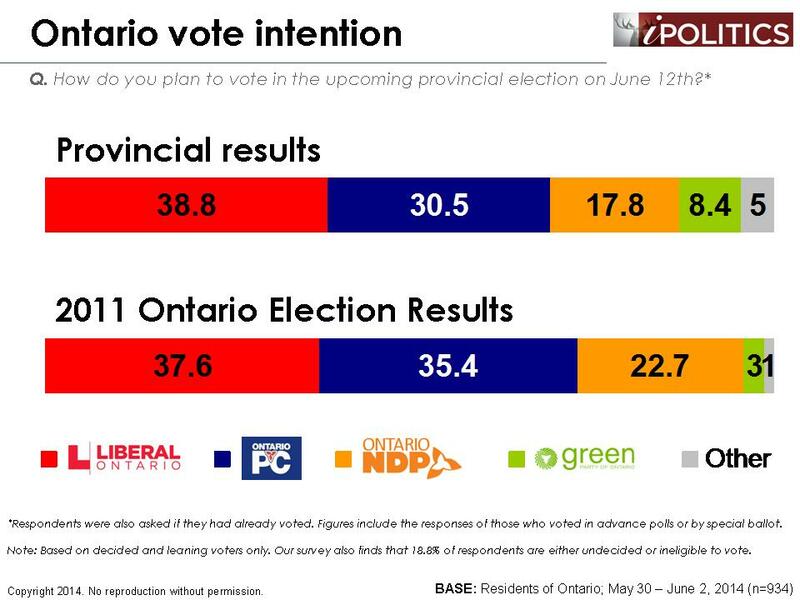 [Ottawa – June 4, 2014] – The Ontario race is still up in the air but Wynne continues to hold the upper hand. Factoring in last night’s 515 cases into our rolling poll we see a narrowed lead for Kathleen Wynne’s Liberal party. At 36.4 points, hold a 5-point advantage over their Progressive Conservative rivals. 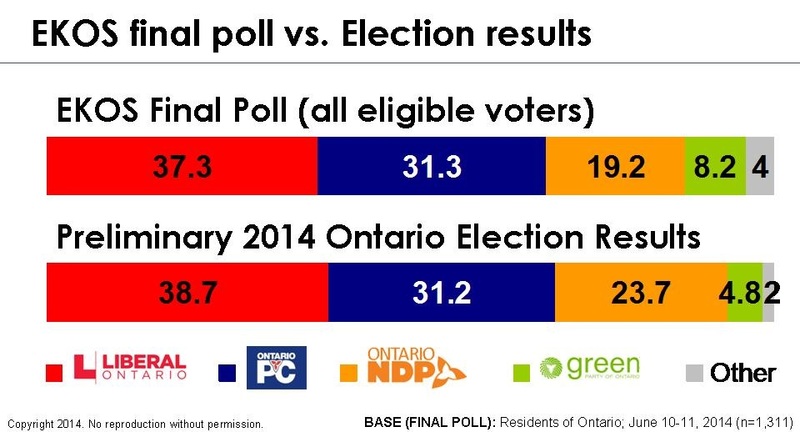 The NDP remains in third place at 19.3 points. [Ottawa – June 3, 2014] –The race sees Kathleen Wynne’s Liberals opening up a wider lead in advance of tonight’s critical debate. Most of this new advantage is due to a three-point decline in the Progressive Conservative Party’s fortunes. Given the limited sample sizes, we would advise caution in reading too much into this shift from yesterday. 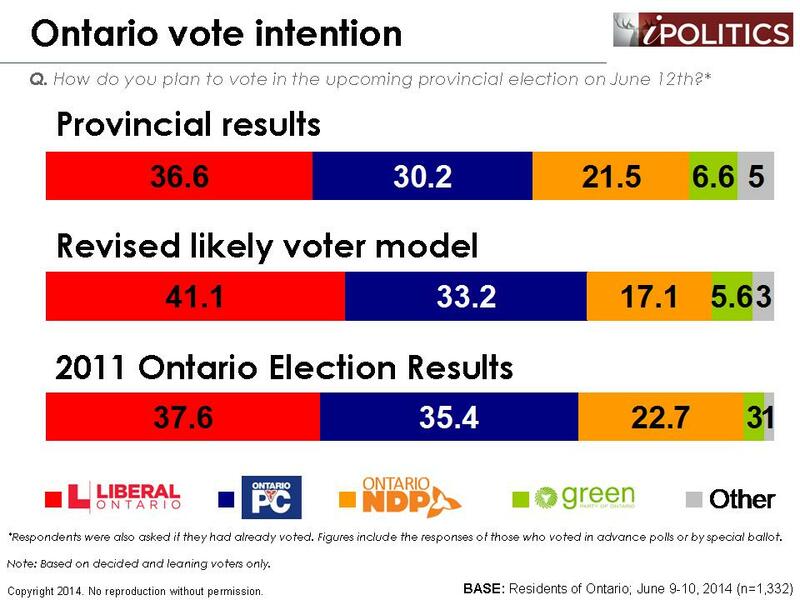 The key points of yesterday’s analysis remain intact although this margin would probably steer the Ontario Liberals into majority territory.